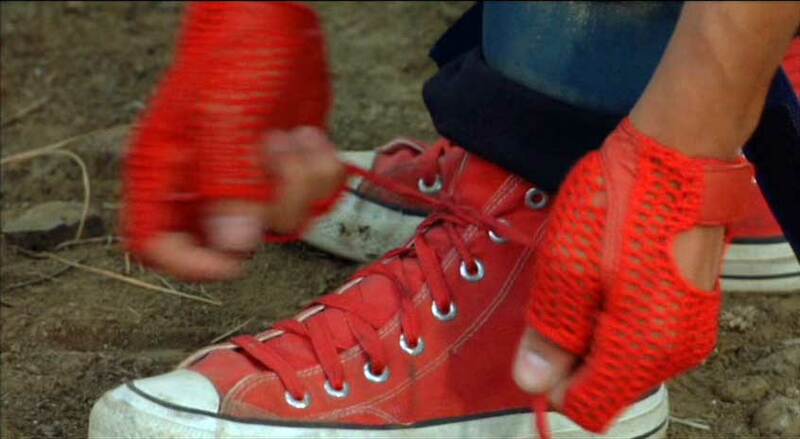 Josh Brolin, Robert Rusler Brooke McCarter, Josh Richman, Brett Marx, David Wagner, Chuck McCann, Tony Alva, Mark Munski and others wear black, red and optical white high top Converse “Chuck Taylor” All Stars in the film. Chrissy and Corey are the star-struck lovers in the skateboard movie Thrashin’. Thrashin’ is a skateboarding movie about Corey Webster (Josh Brolin), a 17-year old championship-caliber skater from the San Fernando Valley who is coming into Los Angeles to compete in a couple of skateboarding competitions and try to get an endorsement contract with a skateboard company. 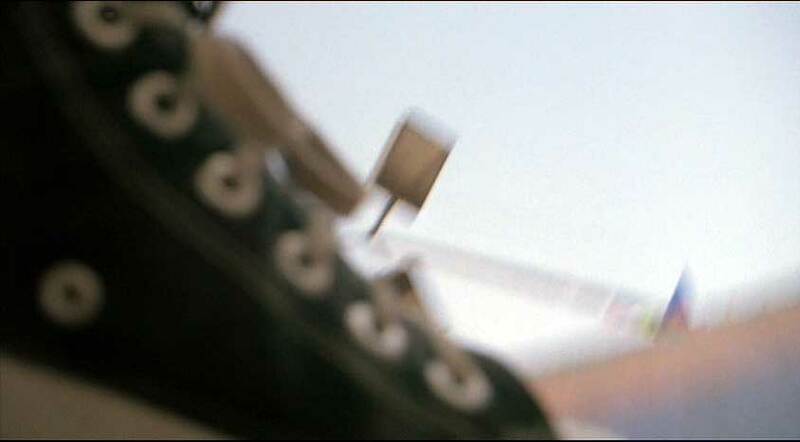 As the film opens, you see Corey get packed and travel into town by a combination of hitchhiking and skating where he heads to the Venice beach area to stay with friends. Corey’s friends Tyler (Brooke McCarter), Radley (Josh Richman), Bozo (Brett Marx), and Little Stevie (David Wagner) are just finishing building a skateboarding practice ramp, and when they finish, we quickly see how talented a skater Corey is when he tries out the ramp. 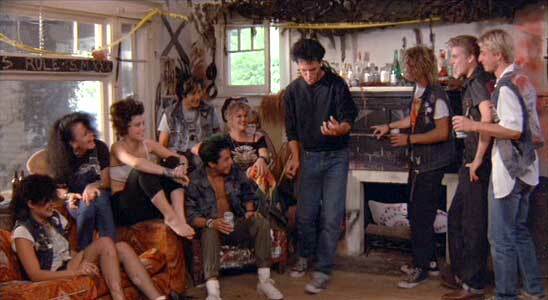 Hook and the Daggers party at their hangout. Soon Corey along with his friends are checking out the local skateboarding scene, which is dominated by the Daggers, a local gang of punk skaters led by Tommy Hook (Robert Rusler) who believes himself to be the best skater in town. Corey is determined to prove to everyone that he is someone to be reckoned with, and he quickly challenges the authority of the Daggers with some skating heroics on their turf. Tommy and the Daggers who show their disdain for other skaters in Venice by their actions and attitude, quickly take a dislike to Corey for his ambitions and for his incursions into their territory. Things are further complicated when Corey and Chrissy (Pamela Gidley), Tommy’s younger sister who is visiting from Indiana, fall in love at first sight, and begin seeing each other against the wishes of Tommy and the other Daggers. Corey is determined to win the L.A. Massacre, even with his broken arm. When Chrissy and Corey continue to see each other, the Daggers start to take action against Corey. 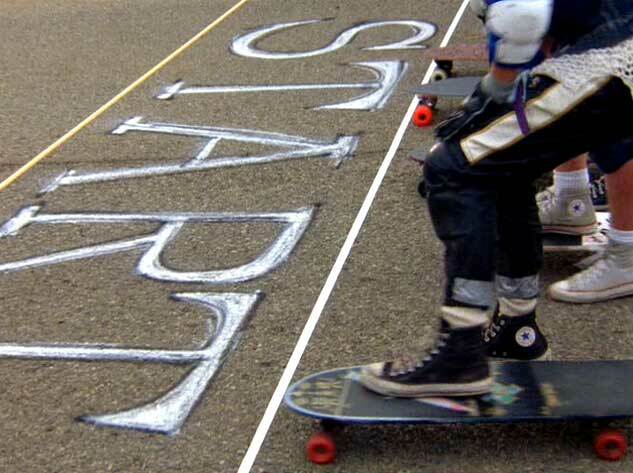 They sabotage him during a skating competition, try to thwart any meetings between Chrissy and Corey, and even burn down the practice ramp that Corey’s friends built. 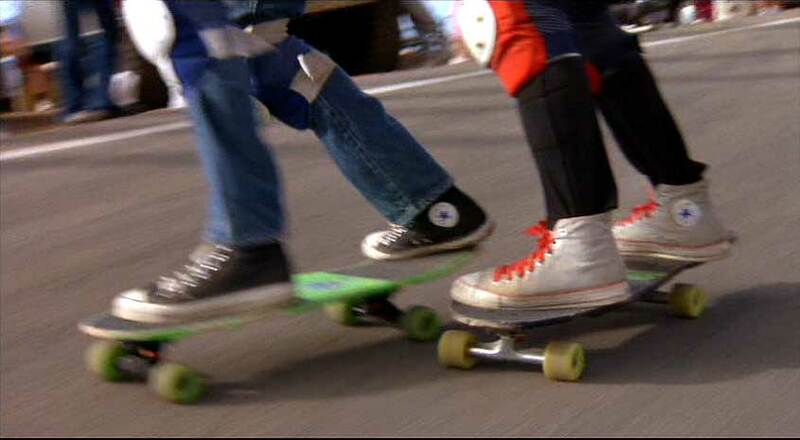 Things come to a boil when Hook challenges Corey to a one-on-one skateboard fight. The action is vicious and Corey’s forearm is broken in the struggle. The fight is broken up when the police arrive, but Corey is determined not to be kept from competing in the L.A. Massacre downhill race by his injury. More than even he wants to defeat Hook, and win a professional contract with a skateboarding company. When Chrissy arrives to check on his arm, Corey tells her to go away, convinced that somehow his involvement with her has led to his troubles. Frustrated by Corey’s reaction and her treatment by her brother and the other members of the Daggers, Chrissy decides to get on a bus and return home to Indiana. The conclusion of the film revolves around the resolution of their romance and the final competition between Hook and Corey in the L.A. Massacre. Corey is injured in the bowl competition when some Daggers throw jacks into his wheels. As a story, Thrashin’ is basically a remake of West Side Story, with much of the plot and character interaction modeled after this contemporary American musical version of Romeo and Juliet. This is not surprising when you discover that the director, David Winters, played one of the Jets in the Broadway and film versions of West Side Story. But let’s face it, the storyline and even the dialogue isn’t the reason you watch a film like this. It’s for the photography and skateboard action scenes, not the plot. Josh Brolin has the look of a skateboard champion, and there is an on-screen chemistry between Brolin and Pamela Gidley that transcends their dialogue. Although is some attempt to introduce other characters in Corey’s circle and among the Daggers, and a few humorous bits, the film soon focuses on the triangle between Corey, Hook, and Chrissy. 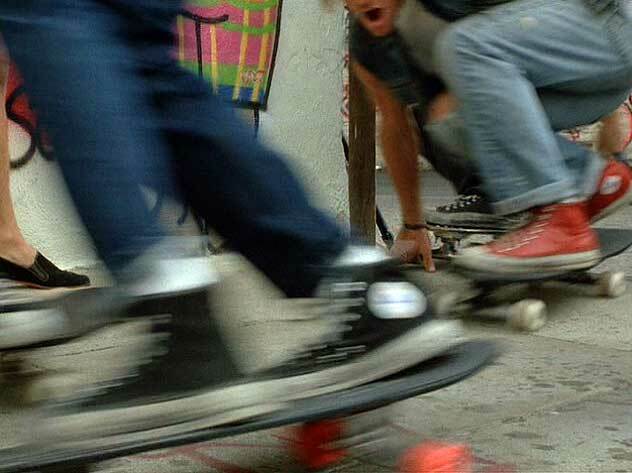 There is a good selection of skater music, and an early video appearance of the Red Hot Chili Peppers that give the film authenticity. 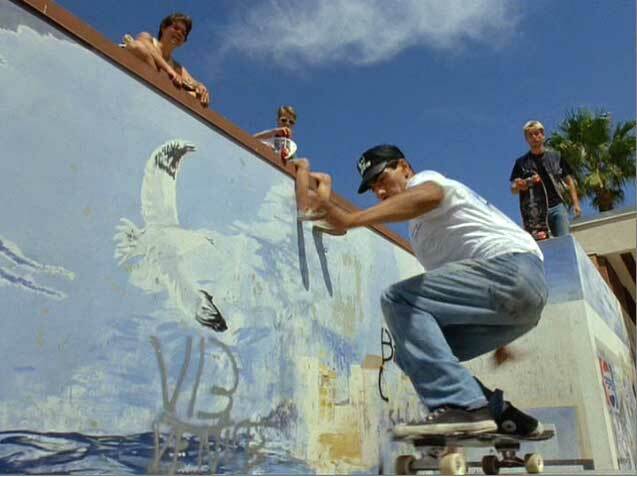 But this film is really a symphony of skater moves and multiple chucks shots, a real period piece of the L.A. skater scene in the mid eighties. That is the basis for someone to enjoy Thrashin’. 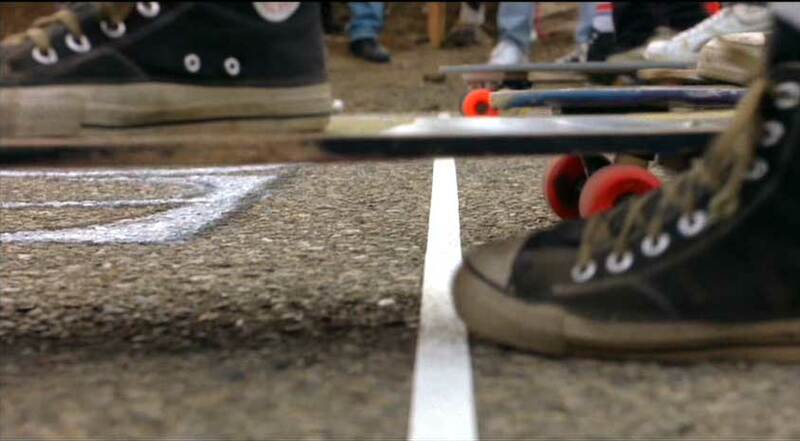 Corey, Hook, and other skaters race downhill in the Los Angeles Massacre. 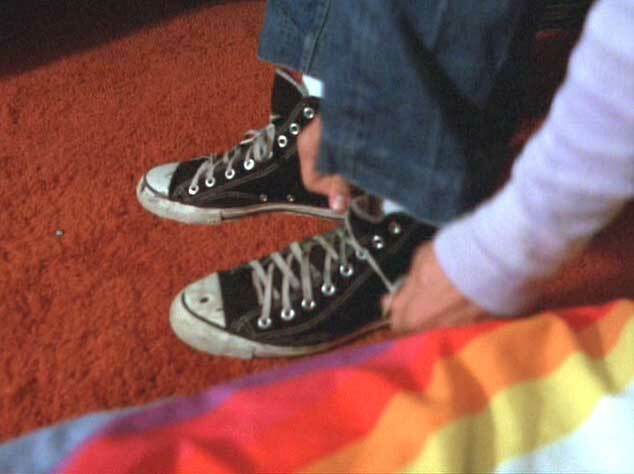 Thrashin’ has great shots of chucks-wearin’ skaters lacin’. . . .
gettin’ ready to start some racin’. . . .
and pacin’ and chasin’. . . .
Thrashin’. (1986) Josh Brolin, Robert Rusler, Pamela Gidley, Brooke McCarter, Josh Richman, Brett Marx, David Wagner, Chuck McCann, Tony Alva, Mark Munski.